Celebrated as the international day of philanthropy, this year’s Giving Tuesday challenged members of the Brandeis Community to be #OneForBrandeis. Within 24 hours, 1,597 individuals raised $438,850 for the University. According to Brandeis’ Giving Tuesday website, the Brandeis community had faced three Giving Tuesday challenges. The Be One for Brandeis challenge aimed to secure 1,250 gifts from the community. Second, the Student Challenge Gift strove to get 100 gifts from members of the University’s student body. Finally, the Heller School Dollar Challenge endeavored to raise $1,000 for the Heller School for Social Policy and Management. The Brandeis community met and exceeded all three challenges. The One For Brandeis Challenge required a total of 1,250 individual gifts to be given. Once that was accomplished, Madalyn Friedberg, the president of the Brandeis National Committee (BNC) and a friend of the University, gave an additional $100,000 gift to support student scholarships. An interactive graphic of the United States on the University’s Giving Tuesday website showed that the most donors came from Massachusetts, with 447 individuals donating. New York came second with 224 donors, followed by California with 131 donors, and New Jersey with 91. In an email to the Justice on behalf of the Brandeis Institutional Advancement Division, Aaron Louison ’11, the director of annual giving, wrote that the University began planning the 2018 Giving Tuesday initiative in August 2018, when a small staff group from the Office of Annual Giving met for a brainstorm session. 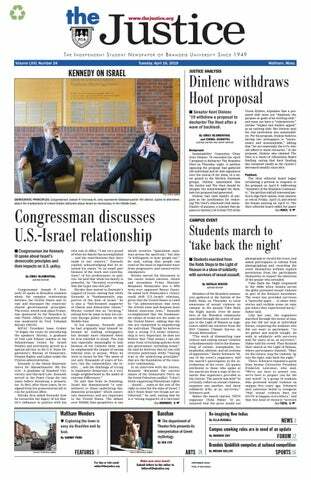 According to that email, the group drew inspiration from University President Ron Liebowitz’s concept that Brandeis has many parts, but is still united. This led to the creation of the #OneForBrandeis campaign. Louison explained that, following this theme, they had “‘one’ challenge gift for ‘one’ hundred thousand dollars and each donor only needed to make ‘one’ gift to count toward ‘one’ goal of 1,250 donors.” The team collaborated with staff from across the University and worked to engage alumni, faculty, parents, staff and friends of the University. According to Louison, the hope was that “various pockets of the community would connect with each other about supporting Brandeis.” In his view, “that is what happened.” Alumni and students took to social media, using a toolkit of information and photos. Alumnus Martin Lieberman ’96 posted on Twitter that he contributed to the #OneForBrandeis campaign “to say thank you for the four great years I had writing and editing and managing a team for [the Justice] and the foundation that work laid for my current career.” The University’s official Instagram account posted a picture of Eric Moyal ’17 MA’18, who worked on the Giving Tuesday team, holding a sign reading #OneForBrandeis that the Brandeis MakerLab created. The University also posted videos on their official social media pages and the Giving Tuesday website, with messages from Brandeis students, faculty, staff and student organizations, such as the a capella group Voices of Soul, asking the Brandeis community to #BeOneForBrandeis. After the goal was reached, the University shared posts thanking the community for being one for Brandeis. During the day, students could grab donuts before climbing up Rabb steps, limited edition shirts and other free Brandeis swag at the Shapiro Campus Center as well as free food at the Stein. The Brandeis Beacons, Campus Activities Board and the Student Union co-sponsored a cash bar. Last year’s Giving Tuesday donor goal was 1,000 to secure the challenge gifts. This year, the team raised the goal by 25 percent, to 1,250 donations.